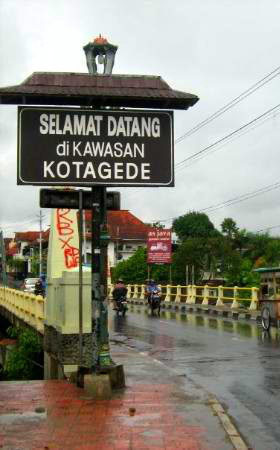 Kota Gede, which is often called Sargede is located about five kilometers southeast of Yogyakarta, Kotagede is a neat little town, which was once the seat of the mighty Mataram Empire. Since the 1930s, Kotagede has become famous for being the center of the Yogya silverwork industry. There are a number of workshops where visitors are welcome to watch silver being transformed into beautiful works of art known as “Yogya Silver”. Kotagede is easily reached by “andong”, the four-wheeled horse-drawn cart, by taxi, bus, or car. In that cemetery complex one can still visit the cemetery of the Mataram kings like Sutowijoyo or Ngabei Loring Pasar, the founder of Mataram Kingdom, who was then called Panembahan Senopati. There is also the unique tomb of Ki Ageng Mangir. He was Panembahan Senopati son in law and also Panembahan Senopati enemy. His dead body was buried half inside of the special area for kings and Panembahan Senopati families, and a half of his body was buried outside of the complex. There is a stone called ” Watu Gilang “, a stone on which Panembahan Senopati smashed the Ki Ageng Mangir head to dead. Those who want to go inside the cemetery have to wear traditional clothes that one can hire at the place. Kota Gede Royal cemetery is open on Monday at. 10.00 am – 12.00 am, and Friday at 01.30 pm. – 04.00 pm. In addition to the cemetery, there are also graceful gates, a pond full of Clarius Melanodermas and a yellow turtle. This turtle is hundred years of age and people believe it as a sacred miraculous turtle. Since the 1930s, however, Kotagede has become famous for being the centre of the Yogya silverwork industry. Kotagede is easily reached by “among”, the four wheeled horse drawn cart, by taxi, bus, or car. There are a number of workshops where visitors are welcome to watch silver being transformed into beautiful works of art known as “Yogya Silver”.